I am very saddened to announce the death of our colleague and friend, Dr. Betty Meggers. 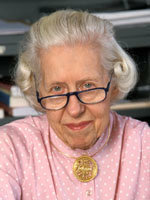 Dr. Meggers was a renowned archaeologist and a member of the NMNH community for over 70 years. She worked in South America and the Caribbean and her work in Ecuador and the Amazon Basin were of particular importance. She received numerous honors throughout South America for her dedication to archaeology and for her unfailing support of academic institutions and colleagues throughout the continent.